Rare and classic photos of some of the Posh Boy bands, artists and friends. The McDonald brothers were known first as The Tourists then as Red Cross at the beginning of their illustrious career. Also pictured are Ron Reyes whose next stop was singing lead vocals for Black Flag and Greg Hetson who found greater fame in the Circle Jerks and Bad Religion. 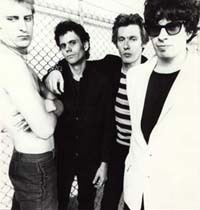 Stepmothers promo shot 1981, L to R, Jay Lansford, Steve Jones, Larry Lee Lerma, Pat (the drummer!). 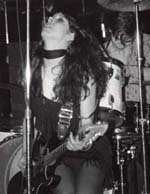 Johnette Napolitano, years before Concrete Blonde (circa 1980) at Club 88. Michael Murphy on drums. Jim Mankey (unpictured) was the third member of Dream 6. Posh Boy first met Johnette when she worked as a receptionist for Leon Russell at his Paradise recording studio in North Hollywood. Later, Johnette worked at legendary Gold Star Studio in Hollywood, literally across the street from the Posh Boy office located in the Alco pressing plant. At one time, Johnette voluntarily catalogued every Posh Boy master tape. 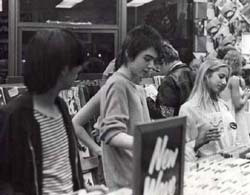 Rik L Rik at Music Plus in Whittier, 1978 with Flipside crew, for his second in-store appearance to promote the release of the F-Word! live album. 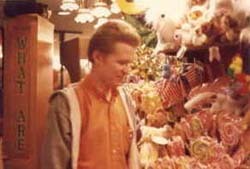 David Hines died in 1994 in a single car accident on I 15 between Las Vegas and the California high desert town of Barstow. David was my engineer, collaborator and confidant for an incredible 2 years from the time in May 1980 when he came in to rescue my Nuns project to when, in late 1982, he stormed out of a session with one of the bands recording for the Rodney on the Roq Vol. 3 album. In between we mined the mother lode of southern California punk rock, raising the standard for technical excellence by a considerable degree. As a producer I would find the groups, meet with them in pre-production (usually in a rehearsal garage) then bring them into the studio where we would record the material we had mutually agreed upon. We soon had a factory assembly line going and it suited the label's purposes for us to work very quickly and not to suffer fools and allow them to waste precious studio time. 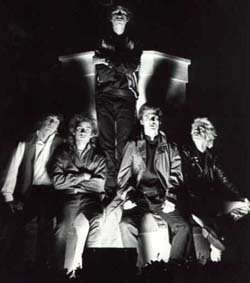 The Adolescents' classic Amoeba was recorded and mixed in just 2 hours. The fact that quality recordings resulted from this frenetic activity was due to David Hines' expertise as a recording engineer. That the teenage musicians were able to play on their own recordings was also mainly due to David's expertise as a professional musician. 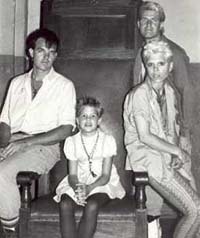 If the producer needed the musicians to play or sing a part differently for effect, it was David who usually translated the producer's desires into terms those on the other side of the glass partition could grasp. 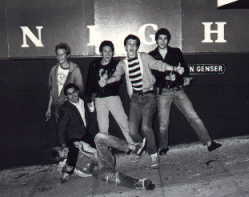 The Simpletones, outside The Whisky, late 1978.